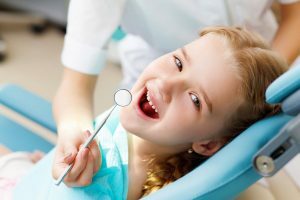 Our pediatric dentist has advanced training and many years of experience with pediatric dentistry. We offer expert pediatric dental care to set the foundation for a lifetime of excellent dental health. Our pediatric dentist and staff take pride in understanding the special care needed by your child. Whether this is your child’s first visit to a dentist, or if they have been in care for some years, we do all we can to help them (and you) feel at ease. As a general rule, you should schedule your child’s first dental appointment once the first tooth has erupted. This usually occurs by 1 year of age. As soon as a child has teeth, those teeth are subject to decay. The primary concern in very young children is “early childhood caries” also known as “baby bottle tooth decay,” which can be avoided with early prevention and home care. Following the first visit, the American Academy of Pediatric Dentistry suggests follow up visits twice a year for preventative cleanings. At home care between visits is essential. Though the baby teeth will eventually be lost they serve important functions for your child.